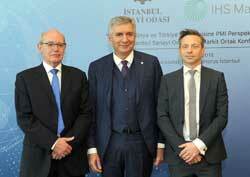 İstanbul Sanayi Odası - ICI and IHS Markit Organized a Joint Conference: "Global and Turkish Economy from the Perspective of PMI"
ICI and IHS Markit Organized a Joint Conference: "Global and Turkish Economy from the Perspective of PMI"
Istanbul Chamber of Industry (ICI) and IHS Markit, which cooperate to issue PMI surveys in Turkey as the fastest and most reliable reference for the performance of the manufacturing industry, in other words the leading indicator of the economic growth, also cooperated to organize a joint conference titled "Global and Turkish Economy from the Perspective of PMI in 2018". In the conference honored by ICI Chairman Erdal Bahçıvan and IHS Markit Executive Director Richard Willis, views and assessments regarding global and Turkish economy had been shared during panels titled "Reading World Through PMI: Growth Dynamics in the Global Economy" and "Macro Overview of Turkey and Istanbul from PMI Window". 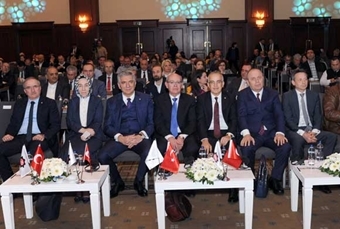 ICI Vice Chairman Irfan Özhamaratlı, Accounting Member of Board of Directors Sadık Ayhan Saruhan, Member of Board of DirectorsSultan Tepe also attended the conference that took place at Swissotel. ICI and IHS Markit, which announced the PMI (Purchasing Managers Index) data of Turkey as the first indicator of the strong growth trend that Turkey entered last year, now, cooperate on two new pioneer reports, too. 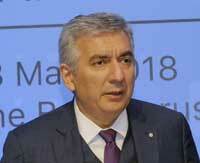 ICI Chairman Erdal Bahçıvan announced these new reports. "With the 'Industrial Overview and Expectations' report that will be begun to be issued quarterly as of next period, the annual expectations and risks of the industry will be revealed. And with 'Export Climate Index', information will be provided regarding the global export markets surrounding Turkish industry." said Bahçıvan. ICI Chairman Erdal Bahçıvan shared his personal ideas regarding global and Turkish economy at the opening of the conference titled "Global and Turkish Economy from the Perspective of PMI in 2018". Bahçıvan announced that they will be working on two new projects with IHS Markit, which they have been cooperating with since September 201 regarding the publication of PMI data in Turkey as the most up-to-date and reliable pioneer indicator for the manufacturing industry. "Industry is the main force behind sustainable, qualified economic growth and development." said Bahçıvan. "Thus the investment, employment and production appetite of the industrialists is a barometer that requires constant monitoring and care in respect of economy's future. PMI data is the first indicator of the growth trend that Turkey has entered as of last year. The latest data showed that the manufacturing industry, the leading sector of Turkey, grew uninterruptedly for a full year. As a report shared in the first work day of each month even though most of the other official statistics are issued much later, PMI data sheds light to all these developments and thus it is very valuable for the Turkish economy. While IHS Markit continues to share PMI data monthly with the public, I believe by heart that 'Industrial Overview and Expectations' and 'Export Climate Index' that we will be issuing quarterly will also be enlightening for the Turkish industry and economy." Bahçıvan continued by sharing the objectives of these two new reports: "As a brand new survey for Turkey, 'Industrial Overview and Expectations' report aims to shed light to the near future by revealing the expectations and risks of the next 12 months regarding the indicators such as economical activities, capital investments, digitalization expenses and profits in our industry. And 'Export Climate Index' that aims to assess the global environment surrounding Turkish industry will be prepared using the PMI data regularly created by IHS Markit for the main export markets of Turkey and provide insight regarding the development of these markets." 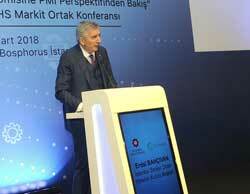 Bahçıvan also mentioned the difficulty of achieving a global balance in his speech. "Turkish economy displays a strong growth performance by taking strength from the recoveries in the external markets, the incentives provided by the Turkish government and the investments gaining speed in the industry. In the remaining days of 2018 that we had a pretty good start, I believe that the path is clear for the Turkish economy and thus it will get a step closer to its goals." said Bahçıvan. 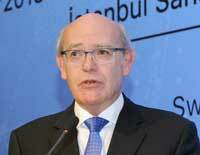 IHS Markit Executive Director Richard Willis stated that they are conducting more than 27 thousand surveys each month just to identify the PMIs accurately in various countries of the world, and that they are trying to measure the Turkish manufacturing industry by conducting such studies in Istanbul, too. 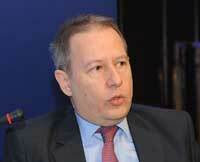 Willis said that IHS Markit is active in South and North America, Africa, Europe, Russia, China, India and Far East. "A decade ago, developed countries were walking over small ones, but today developing countries are making a leap. And Turkey is on this path." said Willis. Willis described the new surveys as follows: "In the 'Industrial Overview and Expectations' survey, we will be presenting the expectations of the companies for the next 12 months regarding main subject titles such as profitability, employee number, cost and R&D. And 'Export Climate Index' is extremely important, too. Turkish economy is in a good state, but what about the countries that it exports its goods to? 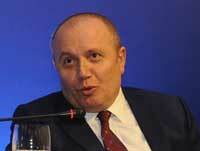 Are Turkish goods still demanded? For this and many questions like this, you will be able to plan and prepare yourself beforehand." The organization continued with two panels: "Reading World Through PMI: Growth Dynamics in Global Economy" and "Macro Overview of Turkey and Istanbul from PMI Window". 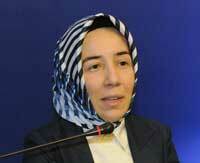 During these panels moderated by Economist Erkin Şahinöz, Turkish Presidency's Principal Economy Consultant Assoc. Prof. Dr. Hatice Karahan, Habertürk Columnist Abdurrahman Yıldırım, IHS Markit Chief Economist Chris Williamson and Economist & ICI Consultant Dr. Can Fuat Gürlesel shared their ideas with the public. "Looking at the content of the approximately 7 percent rate in the growth story of last year, we see a both rapid and balanced growth. Both the internal demand and the external demand found a balance within itself. Moreover, the investments contributed to GDP with a significant increase. Moving from a consumption-weighted internal demand, we had a period where investment had a voice, too. The Credit Guarantee Fund incentives provided by the government were also effective in this. Near the end of 2017, the credit growth rate normalized. And for the fragilities of the economy, the fight against inflation and current deficit should continue. Sustaining the macro values of the economy in a balanced manner is highly important at the end of a successful growth." "The world is going through a tough time for the last 10 years. The financial aspect of the 2018 crisis was handled successfully under the guidance of the central banks. However, after this, broad money policy will end and the cheap and plenty money period will be over. If the world economy continues to improve, new theories may be added to the economy literature for overcoming crisis with monetary growth. What caused the crisis was the abundant liquidity, but we see that the cure of the crisis has also been abundant liquidity. The invested money to be withdrawn may cause damages. Within the next period, we will see the increase of inflation rates and interests in the global economy. PMI provides data that I found very useful and accurate while following the real economy." "Our main goal when we had initiated PMI 25 years ago was to learn the data to comprehend the facts of the economy. Since the official statements and projections did not match the facts. In our surveys, we ask the participant companies to compare their current operations with the previous month. For example, the coefficient becomes 1 if the employment rate is higher, 0.5 if there is no change and 0 if it is lower. We apply the very same methodology in each country and declare the results at the beginning of each month. We work with more than 28 thousand companies in 42 countries. Thus, we obtain plenty of data way before official growth figures are declared. Given the developments in the global economy, we expect an increasing growth in 2019 and 2020 besides 2018. And this is a great opportunity for all of us. The global trade wars that come up in the current agenda may create a risk, but we hope that common sense will win. USA damages itself with trade wars." 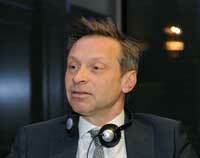 "We see in the recent days that the global economy is being steered by the real economy instead of the finance economy. After the 2008 crisis, the growth that has been tried to be achieved by inflating the asset prices and the commodity prices failed. However, we witness a growth that the industry has been leading since 2016. Thus, I believe the growth is now stable. This has four reasons. First is the developed countries' attempt to regain the manufacturing and industrial elements that they had lost the ground of to the developing countries. Second, digitalization and Industry 4.0 began to positively affect the real economy. Third, China consolidated the excess capacity by lowering their capacities and expanded industrial investments to the Asian countries in its peripheral. Fourth, many countries escaped from carbon economy and headed toward sustainable fields. Even UAE and Saudi Arabia began to focus on industry and manufacturing. All these factors invigorate the industry."